So, you have decided to take your iPad use to the next level and use it for working situations. 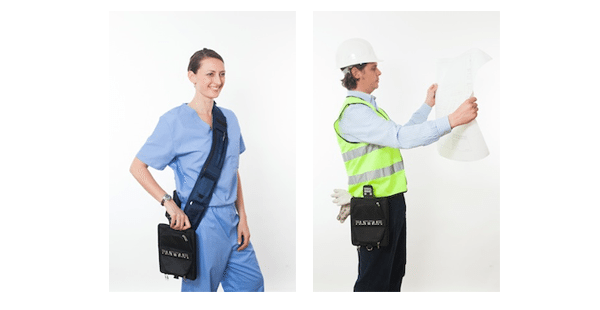 If you’re in an office all day that’s no problem, but what if you are on the go or in the field a lot – how do you carry and keep up with it? The Hands Free is a case, strap and buckle system that will allow you to carry your iPad on a belt or like a messenger bag. The Hands Free comes in three parts the Case, Clip, and Strap. The Case features foam padding, metal zippers and cut outs for cables. The Case also has a seat belt type buckle so it can be attached to the Clip. The Clip is designed to hook to your belt and holds the case via the seat belt buckle. The Strap has several pockets to hold items such as sunglasses and a phone. The Hands Free comes as a total package for $115, or you can buy each piece separately from their website. Look ma no hands with the Hands Free iPad case originally appeared on The Gadgeteer on April 15, 2014 at 8:00 am.